If you consider yourself a serious table-top gamer, then I have a special treat for you today. A review of the Table of Ultimate Gaming. This is a specially designed and manufactured piece of furniture with the sole purpose of fulfilling a gamer’s every wish and desire. In the course of this review, I’ll be going over the materials being used, the features that separate it from just any old table and whether it will actually be able to fit a full set of battle tiles. What is the Table of Ultimate Gaming? 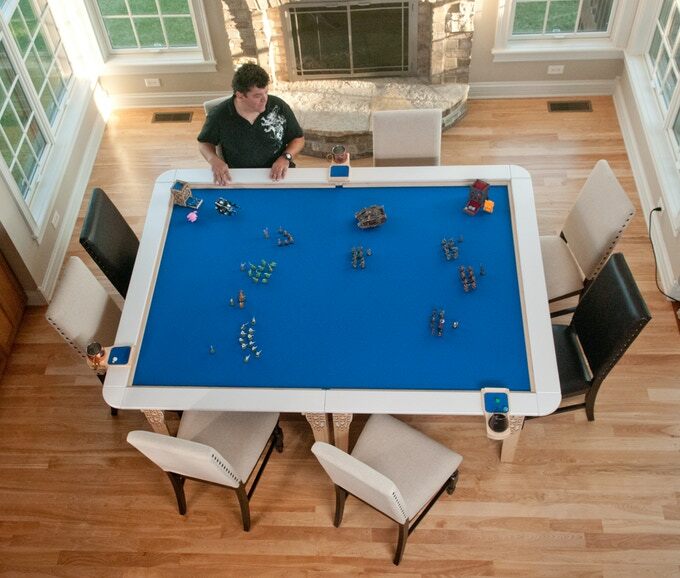 The Table of Ultimate Gaming is an either 3′ x 5′ or 4′ x 6′ large table that caters specifically to the table-top gaming crowd. 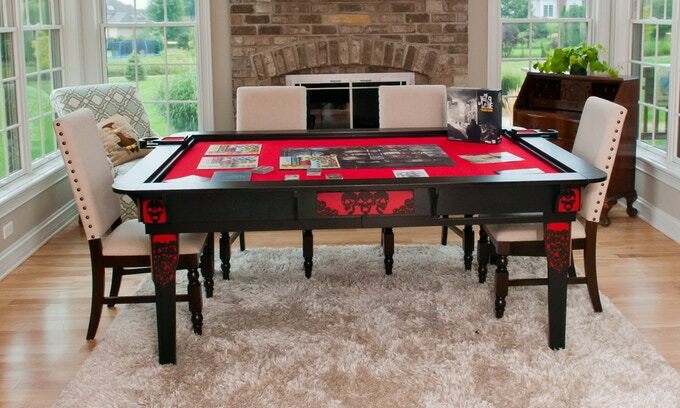 All of the design decisions that go into making this table were made keeping in mind the needs of gamers first. It can easily fit a full set of battle tiles or even the largest board games comfortably, while still allowing plenty of room for all accessories. 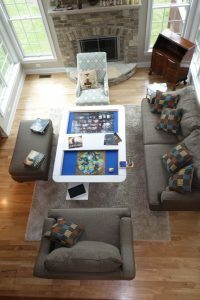 The gaming and tabletop surface is surrounded by an elevated border to all but eliminates the annoying occasions where somebody knocks the cards off or the dice go missing. In this regard, it is not unlike a professional poker table that you would find in a casino. 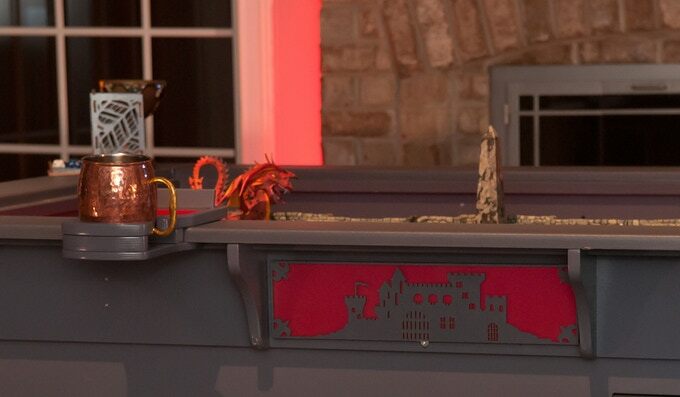 Additionally, the table comes with cover plates that you can put on top of the actual gaming area whenever you aren’t playing on it. 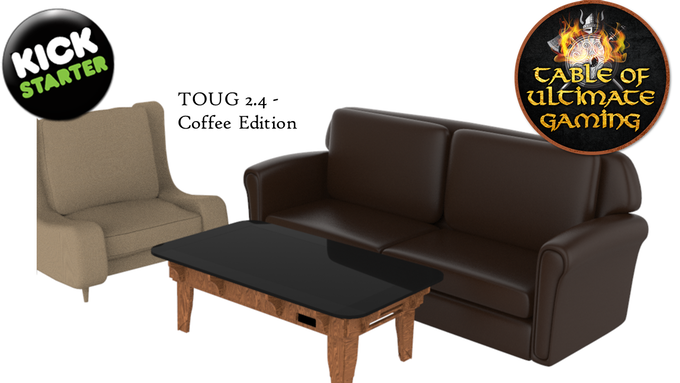 This allows the table to be used just like any other piece of furniture and to be placed in the kitchen or living room. So if you feel like hiding your nerd cred when the parents or guests come to visit, you can do so without putting the table away. The borders, legs, and sides are covered with wood laminate in different color options. On the gaming surface, you will find. In contrast to a poker table, a rubber surface that has the table-top gamer in mind by providing good grip for accessories, cards, and dice. Additionally, you have the option of outfitting it with a host of additional accessories such as cup-holders or extra trays for cards or other gaming accessories. 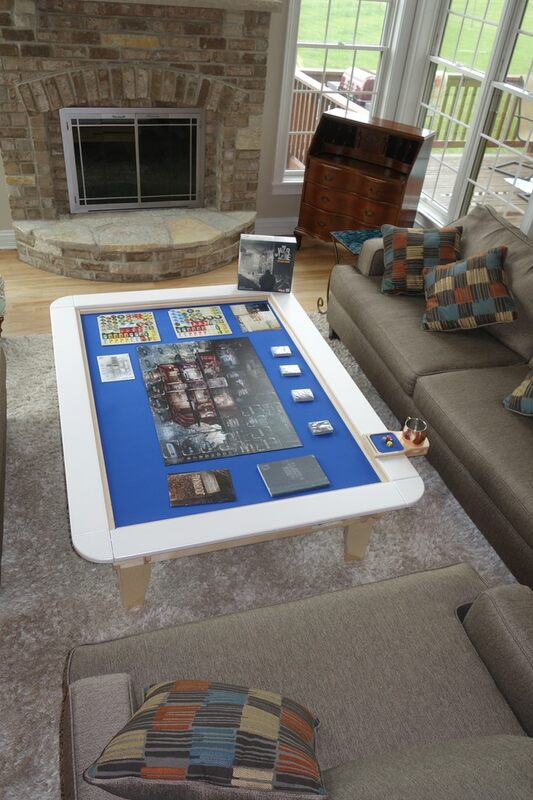 In this way, you can expand and customize the table to be the ideal surface for your game of choice. Whenever the table is not in use, you can keep it covered with the included panels. Meaning your perfect gaming are can be hiding in plain sight in the living room if you so chose. Once the covers come up, the games can begin! There are numerous optional accessories that can be clipped to the side of the table and that range from thoughtful additions like cup-holder so seriously ingenious things like extra trays that can be clipped on. Especially the extra trays can allow players to keep certain cards and item hidden from plain view. Therefore providing that extra bit of secrecy and privacy that you need in order to make certain games work. No review would be completed without a simple and concise overview of what the pros and cons of the product. That being said here is what makes and breaks the Table of Ultimate Gaming. 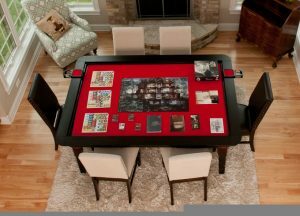 Cover plates allow the Table of Ultimate Gaming to be used as the Table of Ultimate Normalcy, hiding it in plain sight. The ensure set-up is designed with modularity in mind. 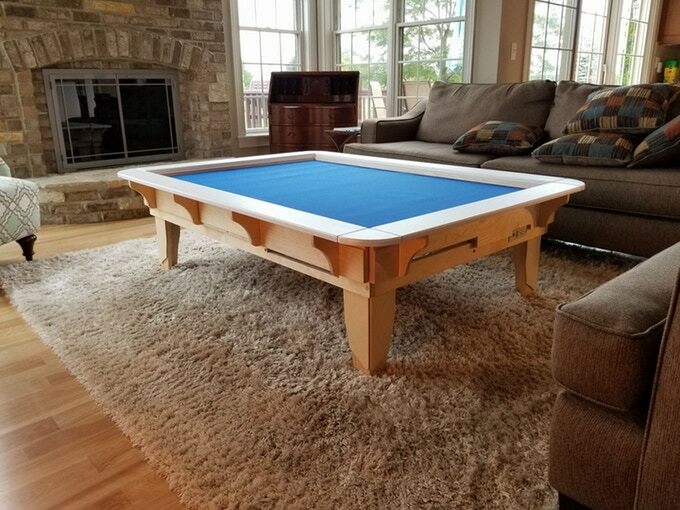 This means you can combine two tables by taking off one of the border rims to double the playing area and clip on a host of available accessories to make the table the perfect fit for your game of choice. Customizable engraving and ornaments on the sides allow you a large degree of freedom in order to make it suit your taste or interior design. AC and USB power outlets in two locations. Something that will be a godsend whether your particular game of choice relies on an access to power or to simply keep your electronic devices charged and handy. At this point in time, the table is only available with wood laminates. While this allows the table to be ordered with a wide range of finishes to fit a great number of interior designs, some people might prefer a solid, all-wood construction. The wooden cover panels are not spilled proof. While the tables laminate coverings and the rubber mats are easy enough to clean, and permanent damage isn’t to be feared, this would have been a nice-to-have. Due to the delivery and construction times, you will have to wait until early 2018 to start rolling the dice on the Table of Ultimate Gaming- The 3′ x 5′ table will set you back $599 and the 4′ x 6′ version is $749. While it is a very good looking table even if you disregard the gaming functionality, this may put off some people. 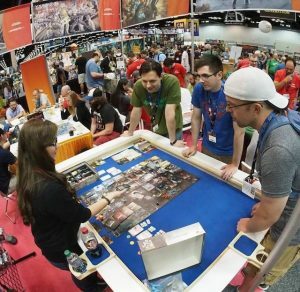 So does the Table of Ultimate Gaming hold up under review? I would argue that it does absolutely, especially when you keep in mind a lot of common sense features that have been included in its design. 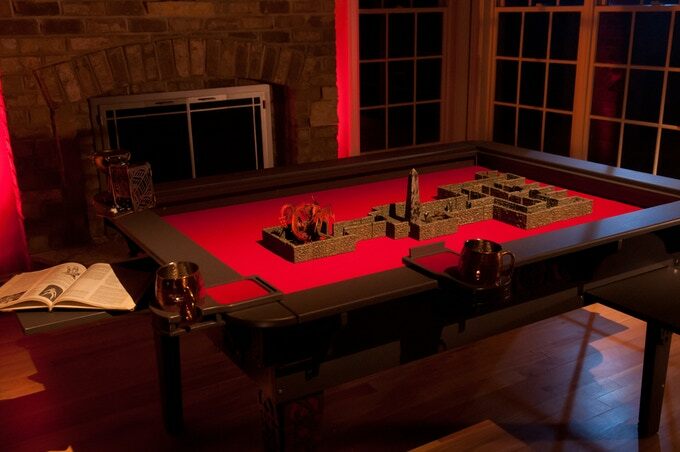 In between the wooden covers, the AC and USB power outlets and the custom ornaments you get a very good table in its own right that also just so happens to be the perfect table-top gaming piece of furniture. Check the latest pricing and availability via the link below.